Hi, ur blog is really nice and interesting, I have bookmark it & anxiously waiting for ur new post. I just wanna suggest that u should go for blog advertising & marketing there is a website called Blogerzoom.com which is offering very unique features at affordable prices. There are Expert advertising teams of Blogerzoom who will promote ur blog & affiliate ads through all over the networks. All u have to do is submit your blog plus pay affordable prices and rest leave it to Blogerzoom advertising team for Advertising & Marketing of ur blog then see how u enjoy a lots of quality traffic plus good readers to ur blog. Paintings of libraries - or which include them - are really interesting too, aren't they. I'm reading Howard's End is on the Landing by Susan Hill which I am enjoying even when I disagree with her opinions. Some friends and I, on a book discussion list, once had a long rambling discussion about the afterlibrary, an idea to replace the afterlife, and what pleasures would be there. I'm ignoring the very ignorable comment before me. Hello Claudia, and welcome to my blog! I have no intention to go for blog advertising & marketing as I'm satisfied with my blog and life as it is. Thanks for your suggestion and welcome back. 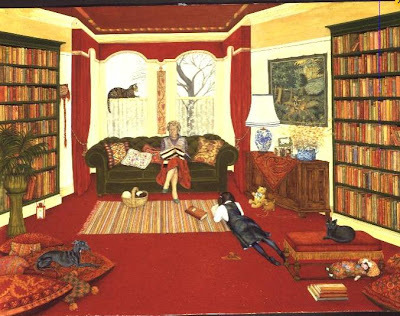 There are not very many painting of libraries - I wonder why! I haven't read, or even heard od "Howard's End is on the Landing" - I'll ask if the library can get it for me. I love the idea about an afterlibrary.See you there! I liked reading it very much lying on his stomach in my girlhood. This managed to get into my reason from the picture. I too read, lying on my tummy - I doubt I could do it today!! That's my kind of room!